World famous tech supplier EOS is looking to revolutionise the world of transport in radical ways. Their latest project has paired them with Gravity Industries in developing 3D printed flight suit components. 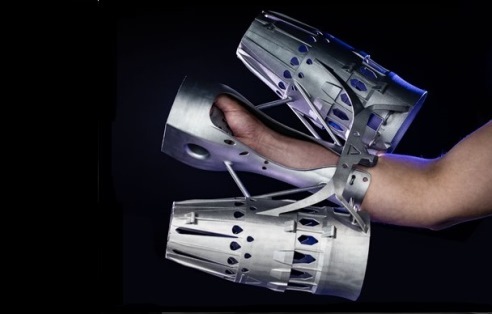 The company originally debuted the suit on November 14th at their booth during formnext 2018 to great applause. The patent pending technology could eventually be a massive boon to one-man flight concepts. 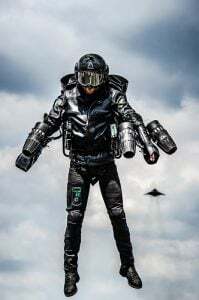 While the idea of a jet pack has been a science fiction staple for nearly a century, the logistics have been illusive. EOS’ suit presents one of the more possible avenues to commercialising the concept. It consists primarily of 3D printed parts and specialist electronics, using five jet engines for propulsion. It achieves an impressive 1,000 bhp and can fly at a speed of more than 70 km per h.
The role of EOS’ industrial 3D printing expertise was in producing “high quality parts which offer high part stability and reduced weight, as well as enabling constant product iterations and optimization“, according to EOS CDO, Güngör Kara. Both companies are testing out new means of refining the suit’s operations. The partnership netted a significant cost reduction along with a design that weighs a lot less than it would with traditional manufacturing. They reduced weight by 10 % for the arm mounts by changing from titanium to aluminum, for example. EOS polymer technology was pivotal in creating cable routings, electronics and battery housings, allowing for constant modifications. Similarly, EOS metal provided the sleek designs of the arm mounts for weight reduction. The 3D printed flight suit was also subjected to the design for AM treatment, which reduced 8 parts down to 3. 3D printing has certainly opened up the field for unusual transport options, whether in the air or at sea. The ability to reiterate quickly and reduce weight is a large part of this gear shift. While it would be presumptuous to think these 3D printed flight suits would take off any time soon, they do represent a massive shift forward for the technology as a whole. Military applications may be the next step, as is often the case. Featured image courtesy of EOS and Gravity Industries, retrieved via Advanced Science News.